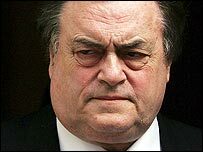 Deputy Prime Minister John Prescott has dismissed reports linking him to secret loans given to Labour as a "lie". Newspapers on Sunday suggested he had made planning decisions in favour of Minerva, a company chaired at various times by Labour lenders. But Mr Prescott told BBC One's Politics Show he did not "know anything" about the firm or secret loans to the party. Labour recently revealed it had received almost £14m in loans from 12 supporters before the general election. Sir David Garrard, who lent the party £2.3m last year, was chairman of Minerva until April last year, when he stepped down and was succeeded by Andrew Rosenfeld, who has himself lent the party £1m. Mr Prescott said: "I don't know who the companies are and I certainly don't know if they were giving money to the Labour party. "It was the press last week acknowledging that I didn't know anything about the secret loans and now I am supposed to have done a deal." He said he had received the planning requirements for a skyscraper in London and a shopping centre in Croydon but felt the decision could be made locally. Mr Prescott added: "I passed it over to Croydon and City of London Corporation. They made the decision, not me. "It's quite untrue to say there was a deal or I made the decision." Asked about Sir David or Mr Rosenfeld, he replied: "I don't think I have ever met them. I am not a great one for circulating among businessmen. "I just do my damn job and therefore I resent it when these implications are made. "My reputation is important to me. My politics is important to me. "I have not made any money from politics for God's sake. But I am here doing what I can best in public service. "I make my mistakes from time to time and we have to be answerable to you guys but not when it's a lie." Mr Prescott said he was "not comfortable" the party had to borrow money and that he had " been an advocate for state financing for the best part of 20 years". Earlier, the Conservative Party confirmed that hedge fund millionaire Michael Hintze had given it an undisclosed loan. Leader David Cameron is being urged to reveal the others who lent the party £20m ahead of the general election. The Tories have resisted calls to name names, as some backers wish to remain anonymous. Mr Cameron's spokesman described a separate newspaper report about the Swedish businessman Johan Eliasch as "speculation". Labour revealed the 12 people who loaned it £13.95m after it emerged that four of them had been nominated for peerages. Environment Secretary Margaret Beckett wrote to Mr Cameron last week asking him to do likewise. But betting millionaire Stuart Wheeler, who has given the Tories more than £5m in recent years, said confidentiality agreements should not be breached. They have until Wednesday to respond. An inquiry into party funding has been launched by the influential constitutional affairs committee.